The stock market has gone through a lot in a very short time. It has plunged drastically and then rebounded back up. The Nasdaq has erased its losses but the S&P 500 and Dow has only managed to recover a little bit more than half. At this moment, we are still wondering if the stock market can rally higher to make new highs or is this just a bounce up that fails to make a higher high. Making a higher low will show weakness in the bull run. Join me on this journey daily as we try and figure out what the Dow Jones Industrial Average, the S&P 500 and Nasdaq 100 tries to do. I will be using a combination of futures and etfs to analyze the market. Do forgive me for any bad grammar or spelling mistakes as I will be writing all this quite fast. By the way I'm also trying to learn how to make a video commentary. So stay tuned for video market commentaries in the future! Yesterday we had a day of indecision. 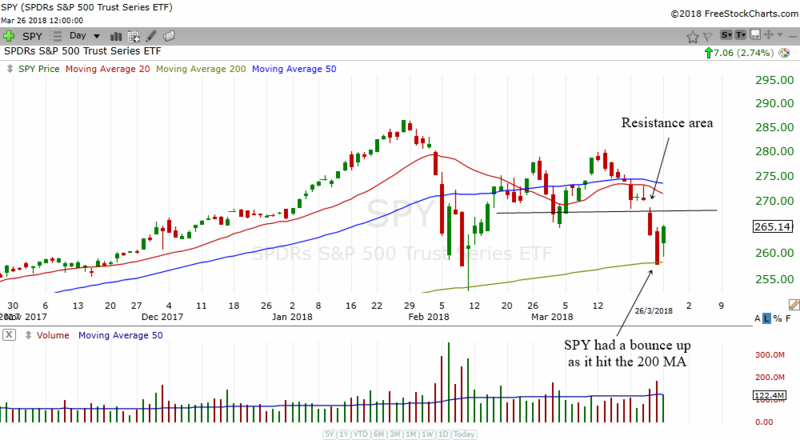 The SPY, DIA and QQQ formed what we call a doji type of pattern. This usually happens when market participants are not sure what course of action to take. 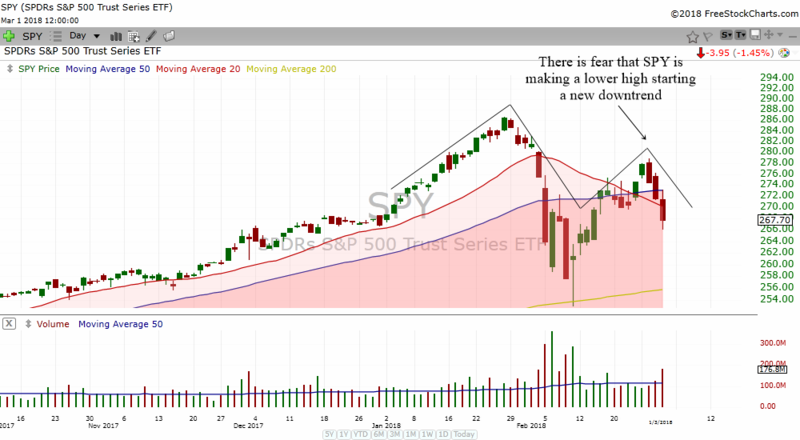 If you look at the daily chart of SPY below, you will understand why the markets was undecided. On one hand, there is a lot of negative sentiment in the markets because of the trade wars and the issue with Facebook. And on the other hand, the SPY is at the rising 200 daily moving average support. This is a powerful psychological level and in the past, the stock market has been able to rally back up when it touched the rising 200 MA. 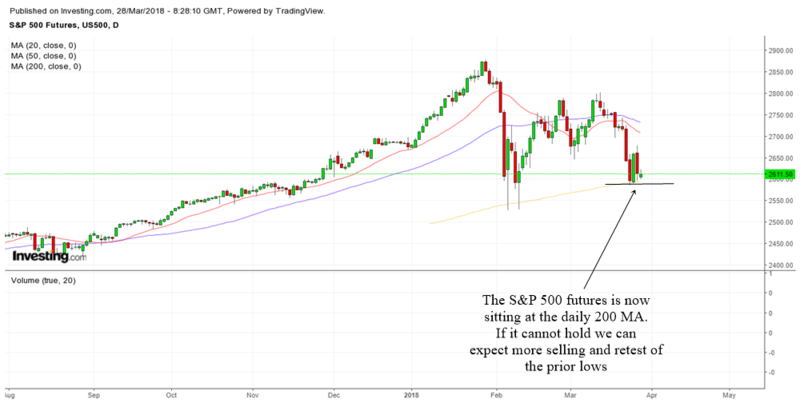 The recent plunge in the markets back in February 2018 has been stopped by the rising 200 MA. Therefore, traders will be on the lookout at whether the 200 MA can help the SPY to rally back up again. If you look at the stochastics, you can see that the reading is quite oversold. Just like the last time in February when it was oversold. That produced a nice big rally and if the 200 MA can hold, we might have another nice big bounce back up. For your information, the stochastics has already given a buy signal. Somehow the markets are still a bit slow to react because as I said the sentiment is very bearish at the moment. 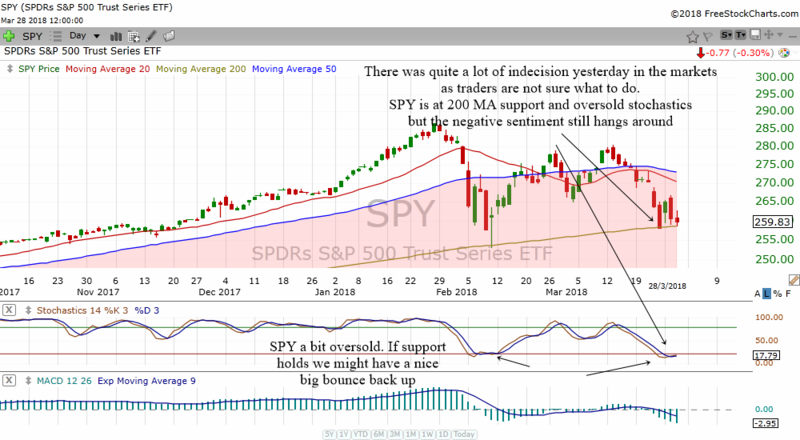 Perhaps we might see which way SPY and the general markets wants to move in today's trading. The chart above shows the 60 min chart of the S&P 500 futures. As you can see the futures did not move that much for the past 2 days. At least it is forming a type of consolidation box that gives us a reference point. If it breaks above the box then it will be good for the bulls. If S&P breaks below the box, then it is most likely to send the markets lower once again. The DIA is forming a 60 min triangle. Triangles can often be reversals or continuation patterns. It tells us that the market is still undecided on which way that it wants to go. It looks a bit weak as it is hanging at the lower trend lines. Well we just have to see which way it wants to break out and then act accordingly. Yesterday we had a nice gap up in the markets but the rally quickly fizzled out as the main indices hit resistance area. The chart above shows us the 60 min chart of the QQQ. 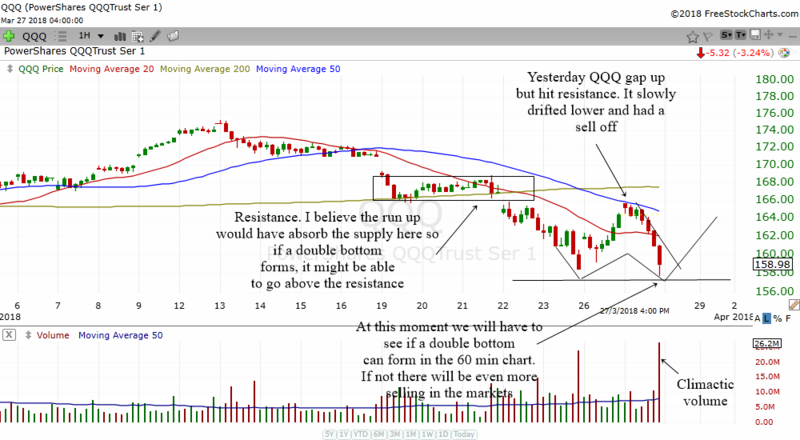 As you can see, the 60 min chart still shows us that the QQQ is in a 60 min downtrend. It tried to rally yesterday but failed to do so and declined as it hit the resistance area which I have drawn with a box. The rise actually halted right at the 60 min 50 MA. Right now it is below all 3 moving averages and therefore it is not trending to the upside. The way to play these kind of markets to play the "hit and run" trades. 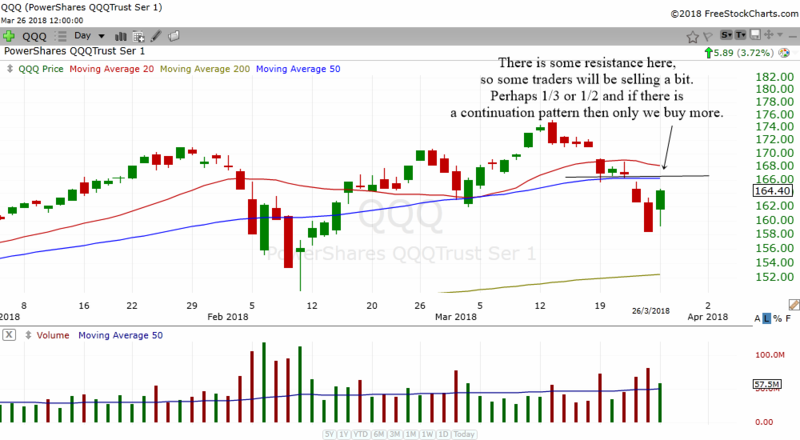 We have to see whether the QQQ can form a 60 min double bottom today. If the support fails, we should expect more sell off. On the other hand, it a double bottom forms we can expect it to rally higher as yesterday's rally will have absorbed enough supply from the resistance to enable the QQQ to move higher. Notice the climactic volume that formed towards the end of the trading day. Usually it can mean that there is too much selling. If the support holds, then this may help to push the market higher as too much selling usually means people are too emotional and selling without reason. The chart above shows the 5 min chart of the QQQ. As you can see, the 2 day rally happened when it broke above a triangle pattern. 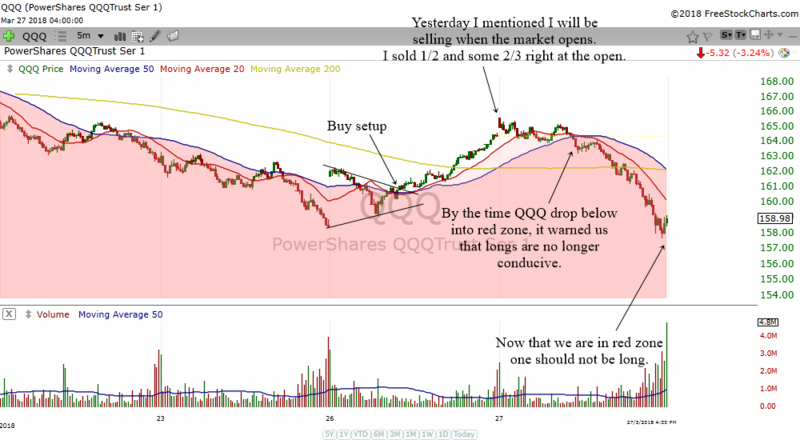 This is where the QQQ went into the white zone and provided us with nice long trades. Right at the open, I was selling 1/2 or 2/3 of most of my positions as I feared a selling may happen. It did materialize as QQQ drop back into the red zone. This is where a good system will be able to keep one out of trouble. When the market is very volatile, you need a good trading system such as the 5 min red zone white zone I have created to keep us on the right side of the market. One must also learn to follow the rules and not let our own hope or fears dominate our trading decisions. When the system tells us to buy we buy, when the system tells us to sell we should sell or short the market. Simple as that. 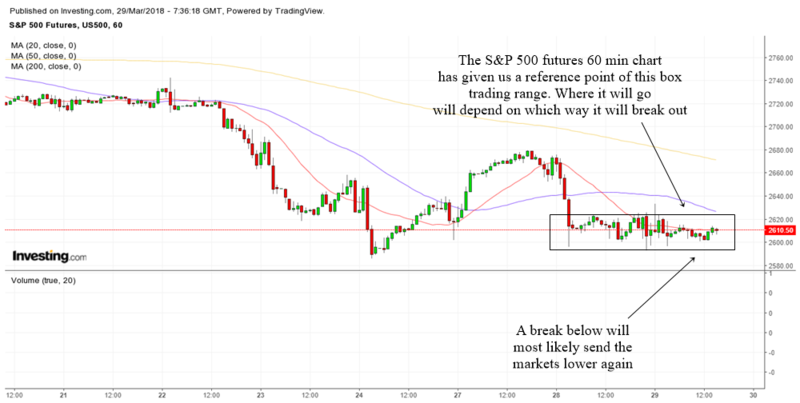 The above shows the daily futures chart of the S&P 500. Right now it is sitting at the psychological rising 200 daily moving average. I think this will be watched by many many traders and investors at this moment. If the 200 MA can hold, the we are likely to get a bounce up and keep the bulls' dream alive. If the support cannot hold we may experience more selling which will bring us to retest the prior lows. Well, someone asked me how to deal with the stock market in case a 60 min double bottom materializes. 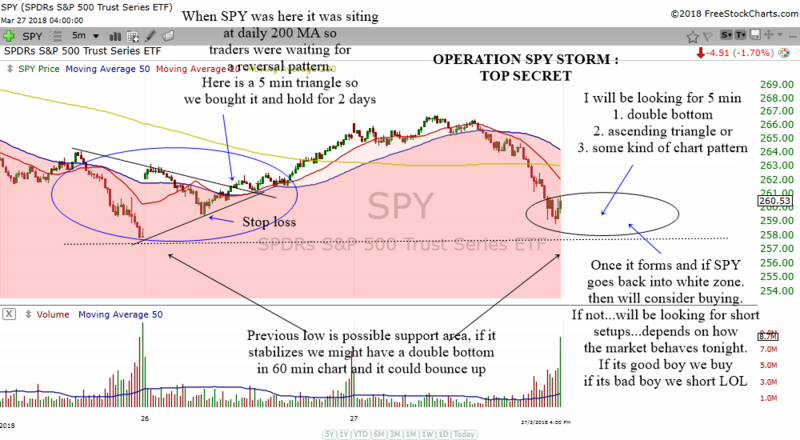 In order to deal with the pattern properly, we will need to zoom into the 5 min chart of SPY. The above shows the battle plan that I have laid out for tonight. While we cannot plan in advance in too detail, we can usually anticipate what might happen and set criterias. If the market behaves as we expect and satisfy the criterias, then we will happen and put a tight stop loss. It will be crucial to see what the market does in the first 30 min of trading. Once more information comes in, we will be able to deal with what the market gives us in a better way. It has been sometime since I updated anything on this website which includes the analysis. I was on holiday and for those who are relying on these analysis, I hope that today will once again help you to make better investing and trading decisions. The reason why the markets bounced back up from a technical point of view is because it hit the rising 200 MA. This is one of the 7 Best Times To Buy Stocks For Short Term Trading which I highlight in the Ebook which you can download from that page. Hello and hope you had a great week. The markets have been gyrating a lot these whole week. 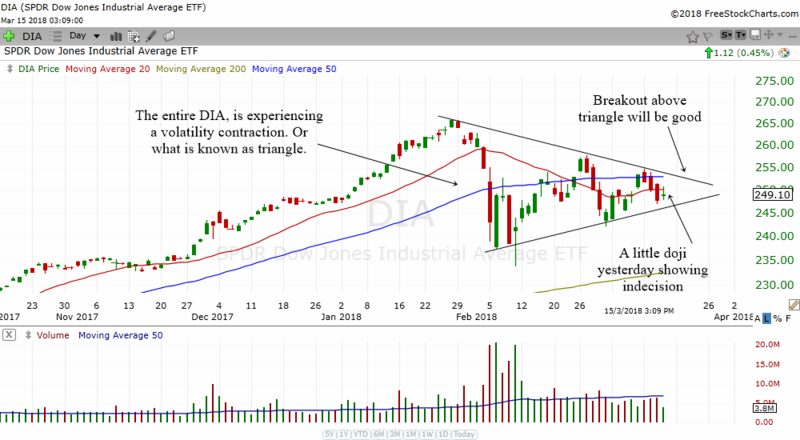 As I pointed out in my past analysis, this is a battle time between the bulls and bears as the Dow decides whether it wants to breakout or breakdown lower in the triangle pattern. 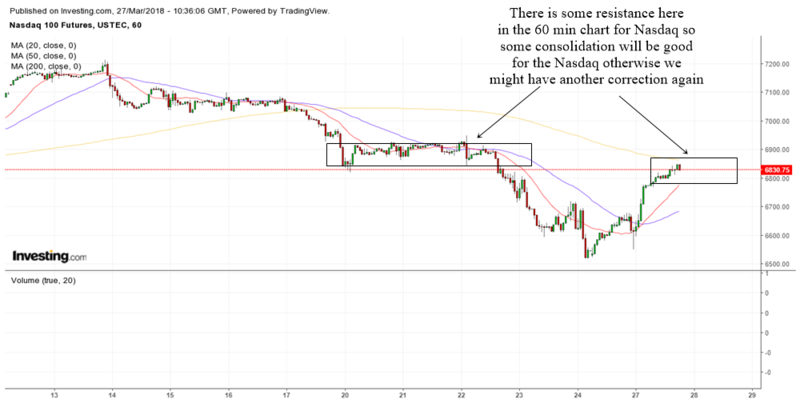 The S&P 500 and the Nasdaq has broken out higher and with the techs leading, it is just very possible that the Dow might breakout higher and follow its brothers. 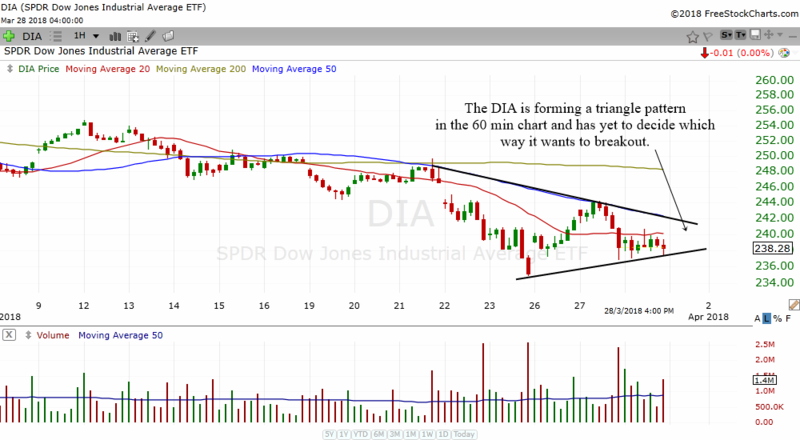 As you can see from the daily chart of DIA above, the Dow is forming a triangle pattern. It is experiencing what I call a volatility contraction period. You see, the stock market moves from range expansion to range contraction. So, as the range contracts, you can expect a range expansion in the near future. What this means is the Dow might be breaking out or breaking down from the triangle very soon. And this might send the stock market higher or lower quite fast. Yesterday we had a little doji in the DIA. This signals indecision in the stock market participants. Many are not very sure what the markets are doing. As there is support below in the Nasdaq investors are not really wanting to sell. On the other hand, the negative news in politics and trade war makes many nervous whether it will affect the stock market negatively. 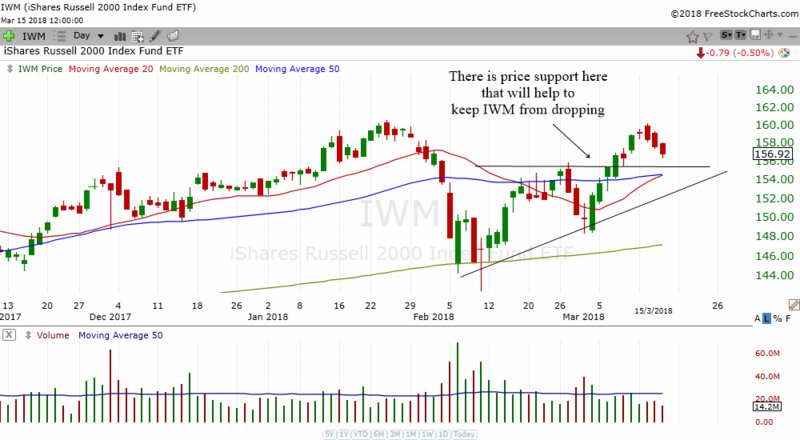 The IWM which represents the small caps have been able to recoup almost all its losses from the plunge. It is already making higher highs and higher lows. There is price support below as well as the uptrend line support. That is why the Dow was not selling off as much as the bears like. With support below in the IWM, hopefully it will provide enough reassurances to the bulls and send the Dow higher. In the event IWM drops to support, we might want to look for reversal signals for any buying opportunities. The chart above shows the 60 min chart of Dow Futures. Sometimes its useful to look at shorter time frames to determine what the bigger time frames might do. 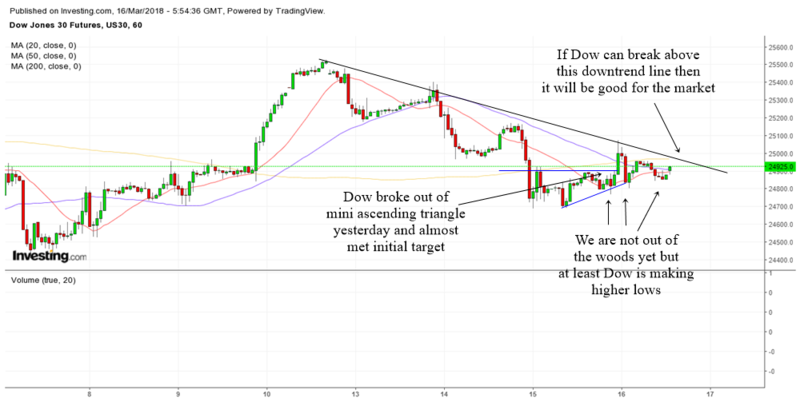 We broke out of a mini ascending triangle yesterday and almost met the initial target before Dow collapsed again. Right now, if Dow can break above the downtrend line that I have drawn then we might experience a nice run up in the Dow. The chart of Nasdaq 100 above tells us that bulls have more to hope for. As long as Nasdaq can stay above the support area and also above the uptrend line then I believe that the bias for the breakout in Dow will be bullish. I think the support area plus the psychological 7000 area in Nasdaq 100 is helping to keep the dreams of the bulls alive. The S&P 500 futures on the other hand looks like it is trying to form an ascending triangle. If it can break higher above this pattern, then it can send the entire market higher as well. Look at the uptrend line. As long as it can stay above this trend line then we can consider the uptrend to be intact. This will be good for the bulls. Apple has managed to recover all of its losses and even make new highs. It is staying above the whole box area I have drawn. If it continues to make higher highs and higher lows, then it will be conducive for the markets. 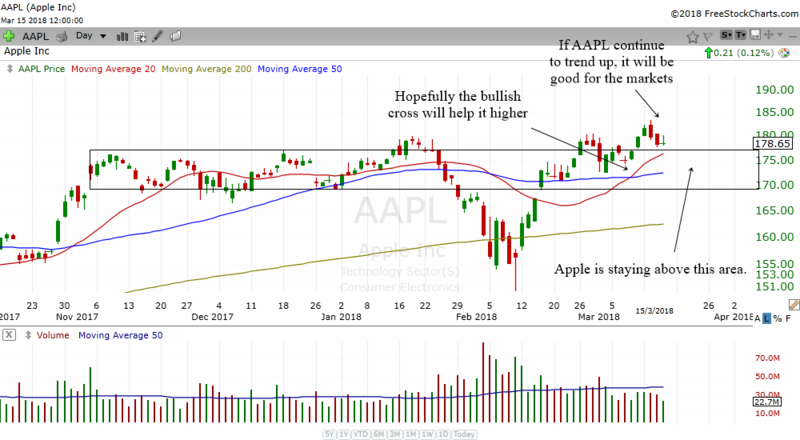 There is a bullish cross in Apple. Hopefully this will help to ignite a move higher in Apple. Today's analysis will be a short one. I'm just going to show you only one chart. The 4 hour chart of the S&P 500 futures. Usually I look at the daily chart and the hourly chart as most of you will know. But at times, its good to look at other time frames as it enables you to have a different perspective. A chart in another time frame can often give us some extra clues on what the bigger time frame might do and that is the benefit of multiple time frame analysis. I have already showed you yesterday that the Dow and the S&P 500 might be forming a triangle in the daily chart. 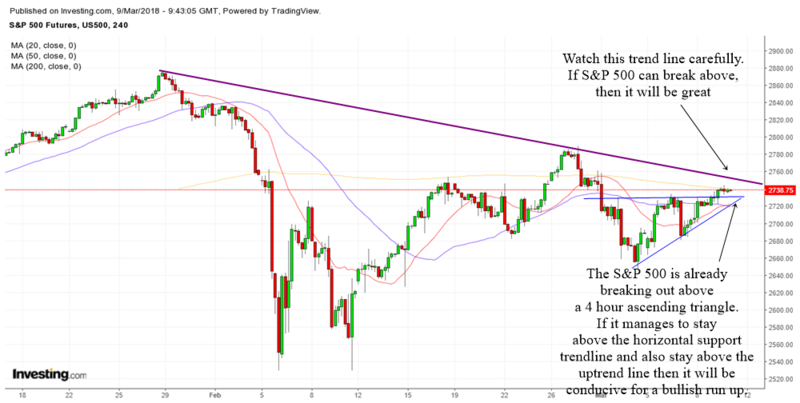 Today, let me just draw a down trend line in the 4 hour chart so that you can see clearer what the S&P 500 might be doing. If the S&P 500 can break above this 4 hour downtrend line then we might have a nice run up. The S&P 500 is forming an ascending triangle in the 4 hour chart and by the looks of it is breaking out higher as I speak. 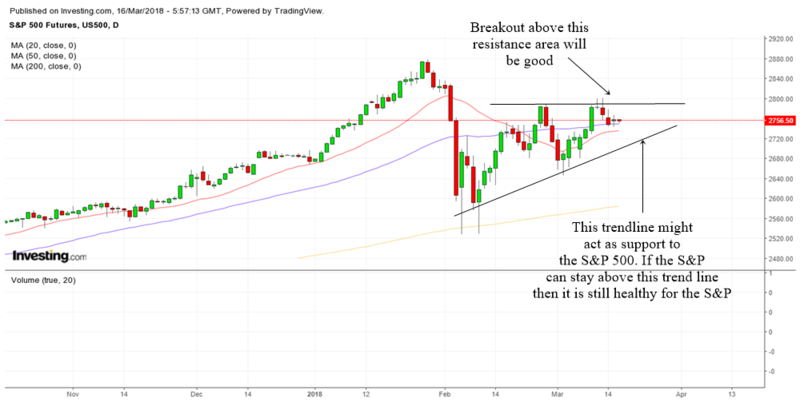 If the S&P 500 can stay above the horizontal support line which is the top of the ascending triangle and also stay above the uptrend line in the ascending triangle then it will be conducive for a bullish run up. Today's stock market analysis will be a bit special. I have finally learned how to do a video and upload it onto youtube. So below is the stock market analysis. The below is inserted a bit late. I showed them in the Telegram group but only inserted it later. We have another wild whippy movement in the major indices. But the ascending triangle in the 60 min chart has been able to meet its target and went a bit higher before Dow collapsed again. 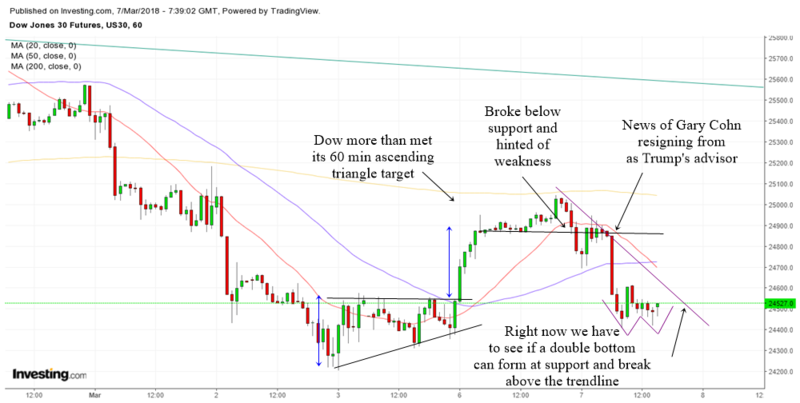 As you can see from the 60 min chart of the Dow Futures above, the index broke out of an ascending triangle. It tried to move higher but then it dropped below its 20 MA and broke below support which hinted of weakness in the index. The news that Gary Cohn was resigning as Trump's advisor sent the markets down. 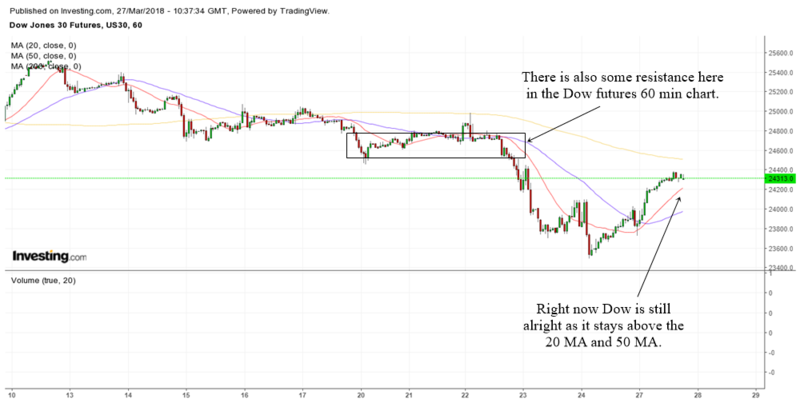 Dow may be trying to form a 60 min bottom perhaps making a double bottom. If support holds and Dow can break above the downtrendline then it is possible for it to move higher. Otherwise selling might continue. It has been a time consuming Monday for me as I dealt with other things. 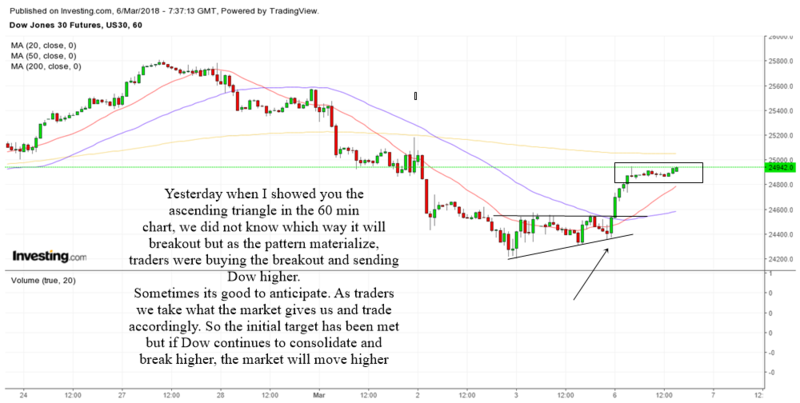 So I only managed to upload some analysis onto the group chat in Telegram where I highlighted that SPY has gone into the white zone in the 5 min chart and an ascending triangle is forming. 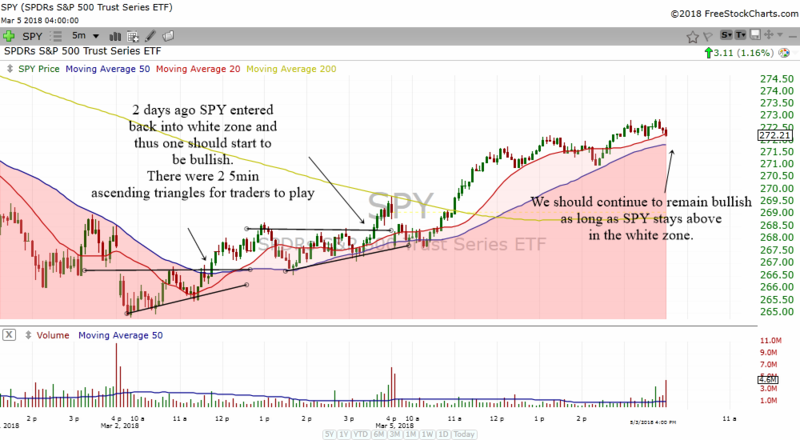 We always need to start off our analysis with a look at the 5 min chart of SPY. That's because we want to be as accurate as possible when it comes to the short term. I believe the 5 min chart helps us to know when to have a bullish bias and when to have a bearish bias. As you can see from the chart above, the SPY went back into the white zone (above 50 MA) on Friday. It gap down traded lower a bit but eventually it formed a 5 min ascending triangle. For those of you who follow my analysis and my work, you will realize that the ascending triangle can be a reversal pattern as well as a continuation pattern. An interesting thing to note is that the SPY broke out of a 5 min ascending triangle as it went back into the white zone. So this was bullish. After that, it formed another 5 min ascending triangle as if it was telling us to get ready to be bullish short term. 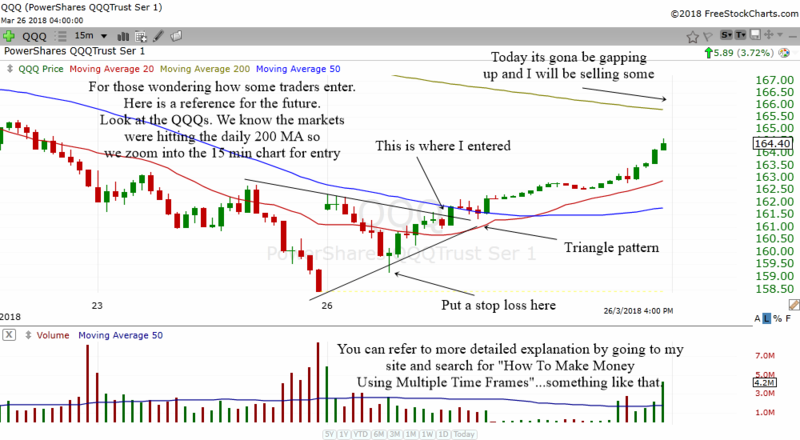 You can trade the ascending triangle as a trading strategy and I do highly recommend that you trade it as it appears frequently and have a high degree of success. Just make sure to look for them in different time frames such as the 5 min, 15 min and 60 min charts. 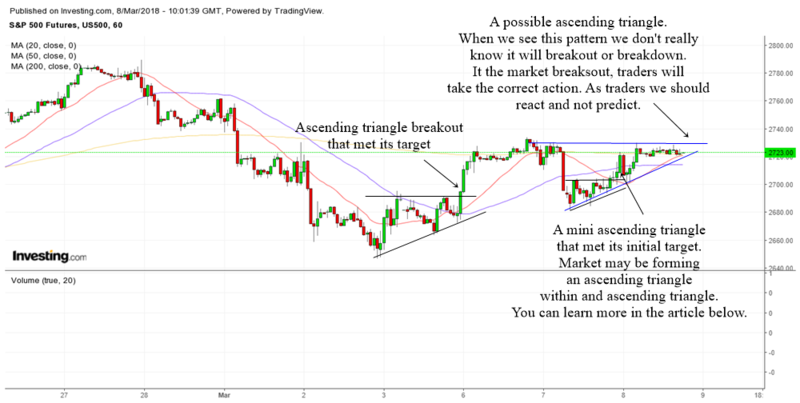 You can learn more about how to trade the ascending triangle by reading the article below if you have time. At this moment, continue to stay bullish on the market as long as SPY is above in the white zone. The chart above shows the 60 min chart of Dow Futures. As you can see, it formed an ascending triangle in that time frame and broke out. I suppose many experienced traders were able to spot it and thus buy the breakout which help to send Dow up by 350 points. Notice how the Dow has gone back up above the 60 min 20 MA (red line) and its 50 MA (blue line). This is a bullish sign. Coupled with that is a bullish cross in the two MAs. This is another bullish sign as well. 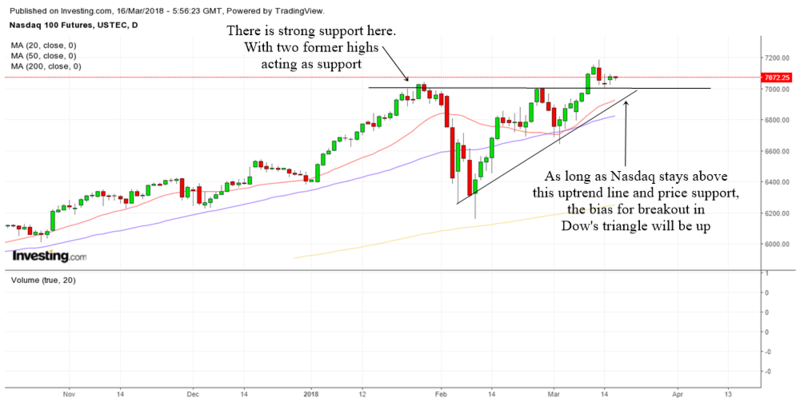 If Dow can consolidate and breakout of the consolidation, this will be another continuation pattern that will send Dow higher in the short term. Take note of the box. Which way it breaks out will show us the short term direction of Dow. 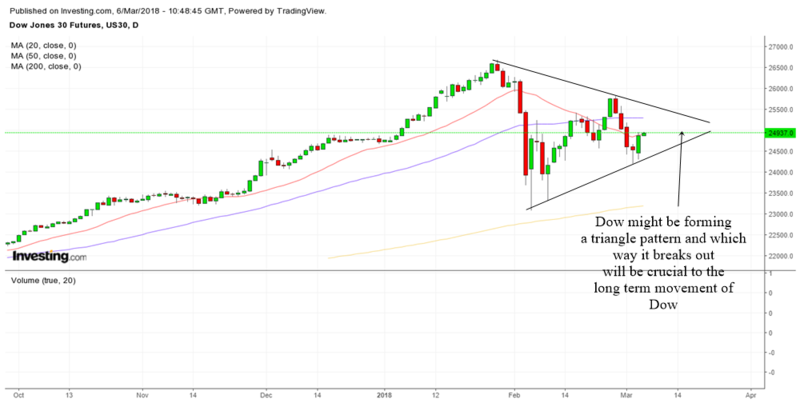 One thing I want to bring to your attention is that Dow Jones might be on the verge of forming a triangle pattern in the daily chart. I know in the past week I have been showing you guys that it might form a cup with handle pattern. It does not seem to be a clean cup with handle pattern now. As we all know technical analysis is not perfect all the time. We can only anticipate and react to what the stock market gives us. The 5 min red zone white zone market timing rule we use warned us of the correction last week. That is why it is important to analyze the market every day and every week if you are serious about trading. Each day brings a new development in the charts and the smart trader will learn how to adapt. Right now, if Dow can stay above the uptrend line it might be able to break higher. Which way that Dow Jones breaks out of the triangle will be crucial to tell us the long term direction that Dow wants to take. A triangle is usually a continuation pattern which favors the previous direction. Since the Dow has been in an uptrend, therefore, the bias will naturally be bullish. If Dow can breakout higher, it will once again send us into new highs in the stock market. Always follow the trend and let your trading rules guide you. The stock market is once again under correction. Therefore, we should be very cautious at this moment. Its a great time to short stocks these 2 days and if the market continues to fall, there will be more money to be made from the short side. The chart above shows the 60 min chart of the Dow Futures. 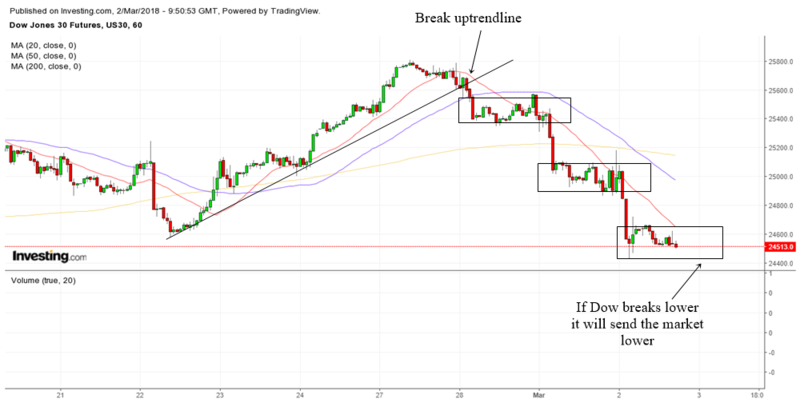 Dow broke below a 60 min uptrendline and this begin the short term downtrend in Dow. It also dropped below the 60 min 20 MA and 50 MA which shows weaknesses in the stock market. Dow has broken below 2 consolidation boxes in the 60 min chart. At this moment it is likely that Dow may break another 60 min box to send it lower. If it breaks below the box, then I believe another wave of selling might happen in the stock market. The chart above shows the daily chart of SPY. There is some fear that the stock market may be forming a lower high. This is usually a sign that the trend is changing from uptrend to downtrend. We have to observe and see if this is just a wide trading range or the beginning of a downtrend. If a downtrend starts then what many fear that a bear market may start will materialize. For those who like to have a more accurate and sensitive market timing tool, you can use Dstockmarket's red zone white zone in the 5 min chart. 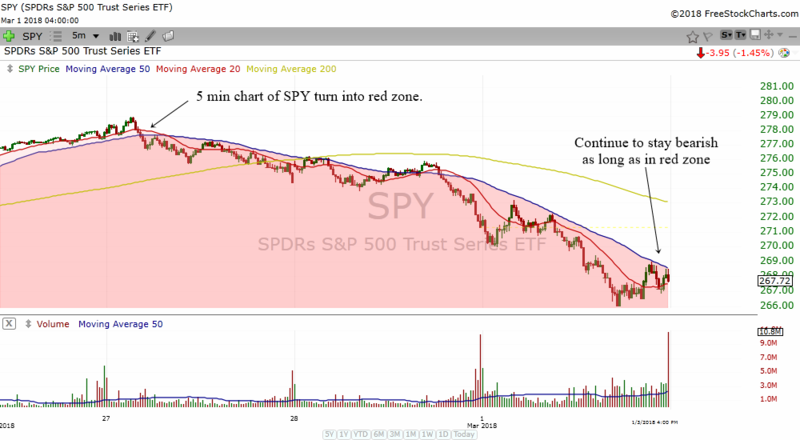 As you can see, the SPY broke below into the red zone 2 days ago. One should continue to remain bearish as long as SPY stays in the red zone. Shorts can be initiated while be cautious of taking long positions.